I don’t know how exactly this happened but it did. I hosted TWO different chats on Twitter! The first was of course, Thursday’s chat at 8pm EST for USBloggerChat! Originally, I had done what I say I’d do in last month’s post of questions. I asked fellow blogger Maria if she wanted to host it for me, but she had to let it go last minute so I decided to take it back. I’ve known about my role as host for Friday’s chat of SpoonieSpeak for at least a month or so. I didn’t think I’d be able to organize two different themes, questions, and answers but I did! Am I officially the master of multitasking now? I decided to put both sets of questions on this post, so I hope you don’t mind. I only decided to talk about Christmas for the USBloggerChat because I doubt we’d have a chat the week of Christmas, somehow I got really lucky of finally getting the chance to ask holiday questions! As far as the SpoonieSpeak chat, I had to go a different route. This chat is for “spoonies” or people with disabilities/illnesses. I have to say they’re a great and supportive community. So I’m thanking Miss Tania for allowing me to take over the reins this week. This chat was at 2pm (7pm GMT) for me, so this makes my first international chat I’ve ever hosted too! Hope you guys like the questions! Q1: Who is excited for Christmas? Q2: Have you been doing blogmas/vlogmas? If not, who have you been keeping an eye out this month? Q3: What kind of traditions do you have at Christmas? Q4: Do you like it better when your gifts are wrapped or inside bags? Q5: If you got one gift card, what card would you love to have the most? Q6: What are the best Christmas cookies? Q7: What is at the top of your list to get for Christmas? Q8: How soon after Christmas is over do you take everything down? Q1: What is your disability/illness? Q2: For those of us who have weak muscles, what do you do to help strengthen yourself? Have any exercises? Q3: What are some daily things that you’ve had to find new ways of doing them? Do you use any special gadgets? Q4: Do you push yourself on different tasks? Like, you know you can do it, but your body isn’t letting you, but you continue? Q5: Do you set a limit of time to learn an old/new task? Like a week, month, or year? Q6: Have you ever had to give up something completely? Something that was already helpful or that you loved doing? Q7: What are your goals for 2016? What do you hope to learn or relearn to do? Q8: Have you found some cool, different products online that you think would help you in someway? After I posted my answer, I began to read others answers and realized that I might’ve been wrong on how I answered it, but then again I thought, “no, there is a difference between the two.” People were saying that if you have a blog, you’re automatically a blogger. I don’t agree with this and instead of explaining my answer on Twitter during the chat, I stayed quiet hearing my thoughts boil up to the top. I knew I had to release it sometime. So here are my thoughts on this subject. There is a difference between the two, being able to call yourself a blogger and having a blog are two completely different things. No matter what anybody says. I stand by my answer and say that I’ve been a blogger for five years (almost six) and have used two different platforms, learned how to do everything on my own and kept at it after going through different things. I never stopped doing it. I talk about it in my everyday life, almost everybody that comes around me gets told different parts of my blog. I am very open with it because it has become part of my life and I cherish it. Not only that I’ve healed myself from different things that I’ve gone through by keeping up with my blog. I honestly don’t like admitting it, but I’ve helped people through my posts. 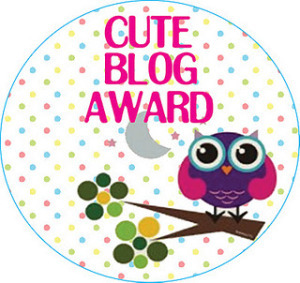 I am very proud of myself and my little blog for doing so much. I feel so blessed to have met other bloggers and enjoy reading all the nice comments I get on different posts. I don’t know what I’d do without my blog, so that’s why I’m in defense mode as you can tell, sorry! Now on the part about just having a blog, when I think of someone just having a blog and not really doing anything with it, I don’t consider them being a blogger. You don’t have to blog everyday I know that, I understand writer’s block very well trust me. This isn’t about writer’s block here. 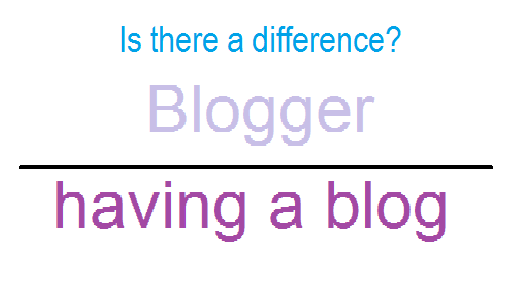 There is a thin line between having a blog and actually blogging on it. To me, blogging is more about pictures and that goes for all of the different themes you select for your blog, beauty fashion, parenting, etc. Blogging is about pulling somebody into your little world that you’ve created in this 2-5 (or more) paragraph post. You try to make them see and understand your pain, struggles, joy, humor in one single post. That’s why I am not a person who supports this thing of calling people who use Tumblr bloggers. They are NOT bloggers by any means! At least none of which that I’ve seen over the years. Both Tumblr and Pinterest are not the ideal platforms to use to share anything. Yes, a picture can say a million words but it’s also like an abstract painting, not everybody is going to meaning of it if you don’t explain why you’re talking about it. I mean, come on! I’ve had lots of different bloggers agree with me on this before, because if you’re just reposting pictures and calling yourself a blogger, you’re calling us real bloggers a bad name. We work hard to give our readers a glimpse of our loves and everyday life and here you are just liking a picture of somebody else’s work and putting it on your profile. You get excited of how everybody is loving your new post. How is that blogging? Let me just say to finally end this post for good. I know I am not the most perfect blogger in the world but I do try to be the best person I can be, and I’m only being honest and real with you. You can agree or disagree with me, I really don’t care what you think. I just had some thoughts on the matter that I think need to be considered before I did anything else today. At least now I’ll be able to go about my evening in peace. So I hope you have a good night and enjoy your Thursday! Mel and Michele are the hosts of Ketchup With Us. There are two ways of doing a post. You could do it in the way I’ve been doing it. A 10 minute post of whatever is in your head at the moment. Or you could link up any post you want, brand new or old post on your blog. Just send it to their blogs! I’m choosing a nine minute song because I’ve basically run out of songs that are ten minutes. So I’m going to the next thing and that is a song that’s 9 minutes and I just have to go a little bit more to get that last-minute, which won’t be that difficult. The song that I’ve decided to use is “The Nomad’s Crown” by the band Xandria from Germany. They’re another female fronted-symphonic metal band. Next month they’ll release their new album! I’m so excited! Today isn’t as dark and gloomy, but according to my mom it is a lot colder than it has been the last few days. Earlier she said it was about 34 degrees outside and she was wearing her Ugg boots. It’s a good thing she hasn’t stuffed every winter clothing into my closet. You can tell the weather is going to change again because the middle of my back, like right in the middle of where they cut me open for my surgeries has pain. I have two of my TV shows on tonight and I have two blog chats also! I’ve been loving all of the new blog links I get at the end of the chats. It helps getting inspirations for new posts and I’m learning new blog terms. I’ve been blogging for five freaking years and I’ve been learning more blog terms than I have ever been. It’s strange! I love also talking to new people, ones with positive attitudes and fun personalities! Last night I watched DWTS and was just supposed to enjoy it with a smile because it’s Disney night. I ended up crying for both James and Amy’s beginning package. We definitely need (as disabled people and children) a handicapped Disney Princess. Watching last night of Amy’s performance just brought out my inner child who always wondered why there wasn’t one in the first place. Other than that, I loved last night. My mom didn’t like who I voted for, but I really don’t care honestly. I still have a ways until I really pick a team. Until the finals that’s when I pick a team. I know I’m weird.